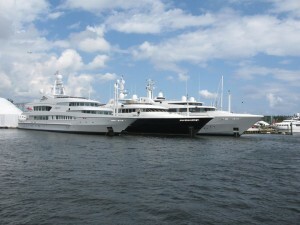 The 2010 Fort Lauderdale International Boat Show (FLIBS) took place from Thursday October 28th until Monday November 1st. There was less hype and advertising this year and all around cutbacks from vendors. Most products were repeats from previous years with few new designs. The Pier 66 brokerage section was not officially used this year. Despite the cutbacks on the management and vendor side, attendance was up. The always optimistic dealers thought things were better. As a brokerage, we had some qualified showings and leads. The show was better than I expected. For the last month, I have been wondering what would happen with this year’s show. Show Management was clearly cutback on promotion. They were not running as many advertisements as usual. Then, a local banker mentioned to me how the hotel and rental car places still had availability the week before the show. In the past, it was impossible to book a hotel room or rent a car at the last moment. There seemed to be little buzz in the air. The days preceding the show, the brokerage email broadcasts started to flood in. As Pier 66 was not going to be used this year, brokerages were advertising boats available for showing at various docks throughout Fort Lauderdale. We sent our share out and received calls from co-brokers and clients. We lined up showings for early before the show and in late afternoons. The show itself showcases the largest selection of mega yachts in the world. What strikes most visitors is the endless line of stern in mega yachts marked “appointment only” docked along the floating face docks from Bahia Mar to the Las Olas Marina. Gawkers wander around the dockage and tents making impulse purchases and enjoying the refreshments. I stopped by to meet a friend late in the day on Friday around 4pm. One of the best parts of boat shows is seeing new and old friends who live elsewhere and just come in town for that one weekend every year. There seemed to be good crowds, so I felt better about the economy. I quickly took to the electronics booth to get up to date on the latest marine electronics. Then, I walked around the complex looking at boats. There were three sailboats in this all power show, and the sailboats were more like powerboats with masts. The traditional mega yacht row was alive and well along the temporary face docks off of Bahia Mar. I stopped by Uniesse along the docks to see if a dealer friend was there. Another friend of my was selling tenders for large yachts. Saturday turned out to be the worst day for him. A steady, heavy rain cut attendance and purchasing. He lost money that day but made a bit over the whole show. Sitting in my office late Monday, I watched yachts return from Bahia Mar to the boatyards along the Dania cutoff canal. Today, Royale Palm Marina, which has been half full since last Spring, is full of assorted shiny new yachts hanging around after the show. All in all, businesses are down to the essentials of sales. The industry is entrenched for a slow recovery that I estimate will last 5 years. Everybody is going through the minimal motions. Businesses realize that there will be a slow recovery and that they need to pace out their investment appropriately. After 5 years of gradual improvement, the marine industry will be back better than ever. The 2010 FLIBS was another small step in that direction.